In the year 1849, a boy and a girl were born on the same day in neighboring houses in a small rural village in Burma called Oksitgon. Burma is now known as Myanmar. The boy’s name was Maung San Nyein and the girl’s name was Ma Gywin. For simplicity, we will refer to the boy as Nyein and the girl as Gywin. 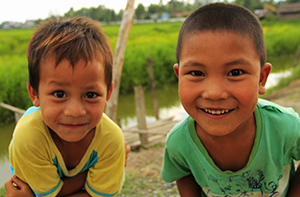 Nyein and Gywin played together, grew up together and came to love one another. When they became adults, Nyein and Gywin married and worked as farmers. Nyein and Gywin, knew a couple in the village of Oksitgon named Maung Kan and his wife. As they entered life together on the same day, the lovers, Nyein and Gywin, man and wife, died on the same day. At the time, Britain was waging a war with Burma in an attempt to reestablish England as a colonial power ruling over Burma. Britain won this war on November 28, 1885. While still living in Oksitgon, in 1886, Maung Kan’s wife gave birth to twin boys. The couple named their sons Maung Gye and Maung Nge. For simplicity, we will refer to them as Gye and Nge. Shortly after their twin sons were born, Maung Kan and his wife left Oksitgon and moved to the village of Kabyu in Burma, which is where their twin boys grew up. When Gye and Nge developed the ability to speak, their parents heard their sons referring to each other as Nyein and Gywin. Gye was referred to by the twins by the male name Nyein, while Nge was referred to by the female name Gywin. Their parents recalled that these names matched the names of the couple that they had known in Oksitgon. Considering the possibility that their twin boys were remembering past lives as the couple Nyein and Gywin, they took their sons from Kabyu to Oksitgon to see if their boys would recognize places from these hypothesized past incarnations. Indeed, Gye and Nge recognized roads in Oksitgon that lead to houses of people that they had known in their past lives as Nyein and Gywin. They recognized their past life home and inside this house, they recognized clothes that they had worn in their previous lives. When the young twins ran into a woman in Oksitgon named Ma Thet, Nge, who recalled being the past life wife, Gywin, spontaneously remembered borrowing money, specifically 2 rupees, from Ma Thet, that was never paid back. Ma Thet confirmed that she did loan 2 rupees to Gywin that was never repaid. When the twin boys were 6 years of age, Harold Fielding, who documented this case in his book, The Soul of a People, met them. Fielding noticed that the physique of each twin matched who they were in their past lives. Gye, who remembered being the husband, Nyein, was larger than his twin. In contrast, Nge was smaller, reflecting the build of the wife, Gywin. Change of Gender: Gywin was female, but reincarnated as Nge, a male. Physical Resemblance in Reincarnation Cases: Though there was no documentation regarding facial features in these cases, it was noted that the physiques of Nyein and Gywin were reflected in builds of Gye and Nge.